When choosing the best dirt bike stand for your needs, you first have to decide where you intend to use it, the home workshop, the track or trails where you ride, or both. It has a big bearing on the type of stand you choose. Some of the dirt bike Lift Stands in this review are compact enough to work great at the track and the garage, so the one stand will have you covered. The Triangle stand: The simplest and cheapest, but doesn’t lift the wheel off the ground. Motocross bikes don’t come with a side stand, so a dirt bike triangle stand is a quick solution. The Static or Fixed stand: These aren’t height adjustable, you have to lift the rear wheel up and slide the bike on. These also come in folding types for ease of transporting. The Lift Stand: Height adjustable with a lever to raise one or both wheels off the ground. The best dirt bike lift stands have an adjustable deck. The Hydraulic Scissor Lift Stand: Allows you to lift the bike up to a standing working height, but better suited to the smooth even floor of a workshop. 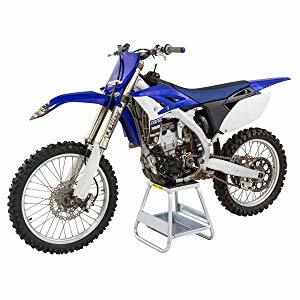 If you’re a regular dirt bike rider, the ideal setup is to have a lightweight fixed stand for outdoors, and a more substantial adjustable lift type stand for the garage. 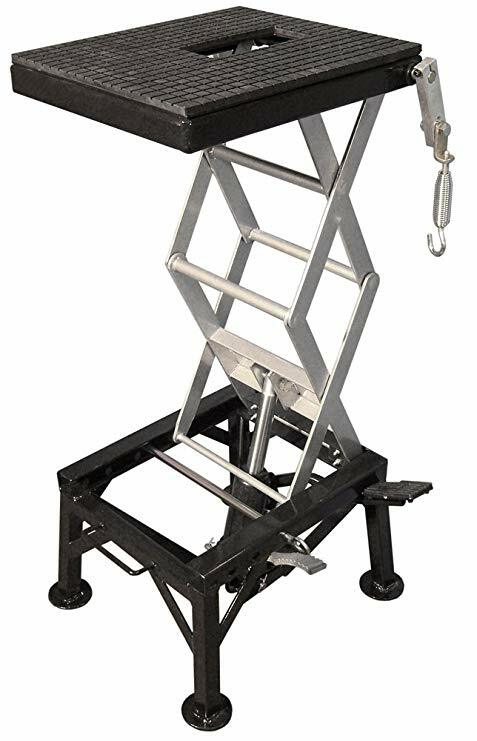 Triangle stands are the easiest to use and don’t require any lifting, however, Fixed Stands or Lift Stands are necessary to get one or both wheels off the ground for tasks like removing a wheel for tire changes. While a Lift Stand makes it easy to get the bike raised, they’re not always as sturdy as a fixed stand and don’t usually have a quite so large top plate with a hole for draining the oil during oil changes. Sturdy construction. You want it to safely support your bike without too much movement. 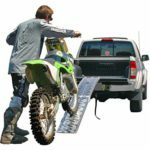 The load capacity is something to be aware of, but most are designed for loads way in excess of the weight of a dirt bike. The Range of Height Adjustment. If you are looking for a lift stand, the minimum and maximum heights are critical. An adjustable top deck is an important feature. The Price. 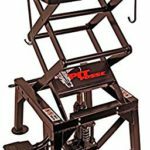 Fixed stands are generally pretty inexpensive, but your budget is something to consider when getting into the more complex scissor type lift jacks. I’ve included stands here from $39 up to $261. All the stands in this review have overwhelmingly positive reviews from users. Let’s look at these stands in more detail. 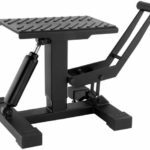 The BikeMaster Easy Lift & Lower Stand is my top pick for Lift Stands. It has all the things you are looking for in a lift stand, and all for a very competitive price. The deck height is fully adjustable so that you can fine tune it to suit your bike perfectly. It spins up or down on a threaded bar, so you just slid it under your bike, adjust the deck height, and lock it into place with the screw lock nut. The bike can be spun around with the lock nut loosened, but for stability, it’s best to lock it. Then with one push down on the lever, your bike is up. It will comfortably raise one wheel or two off the ground. For safety, there is a lever lock which secures the lever in the down position, which will prevent accidental disengagement when the bike is on the stand. The anti-slip pad is essential to stop your bike slipping off the stand. When lowering your bike, the damper shock slows its descent, which is a great feature to have. This lift stand is portable enough to be taken with you to the trail or track. 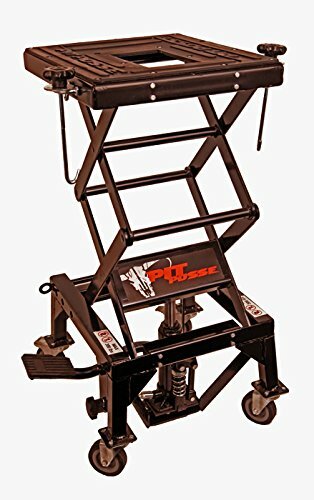 The Pit Posse Dirt Bike ATV Scissor Floor Jack is at the top end of the lift stand scale. It allows you to raise your bike to a comfortable working height. 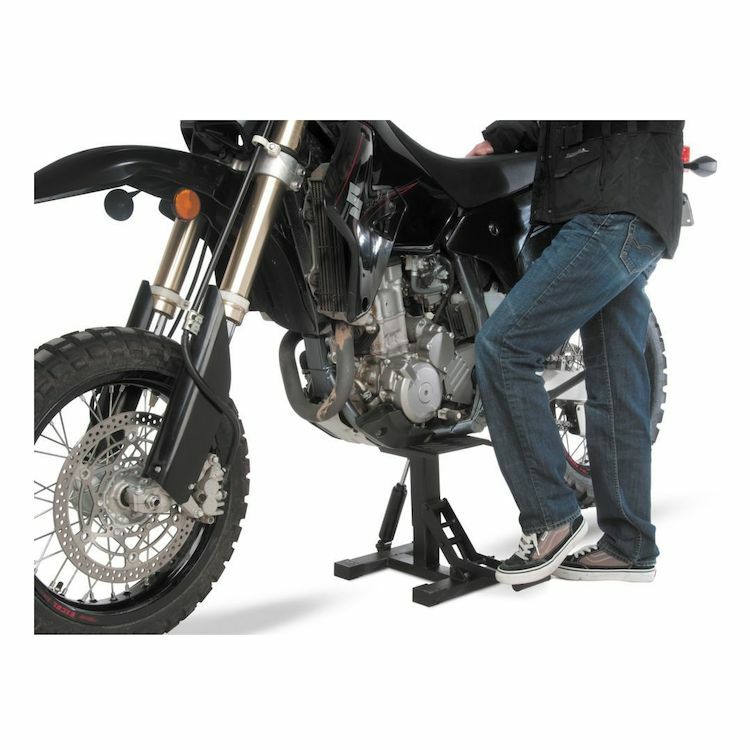 The stand lowers to 13″ (330mm) and simply rolls under your motorcycle on the wheels, and can be pumped up to a comfortable working height, the maximum height is 36″ (914mm). Once you’ve got your bike at the height you need, you can lock the wheels. There are loops to attach tie downs to the bike to secure it, and a safety pin which slides through the frame to prevent the bike lowering unexpectedly. 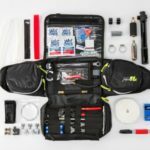 The deck measures 13 3/4″ x 16″ (350mm x 406mm) and has an anti-slip rubber pad and a drain hole which is for doing your oil changes. Because it is a collapsible scissor jack there is no tray, so you will have to hold a tray under it to catch your oil. 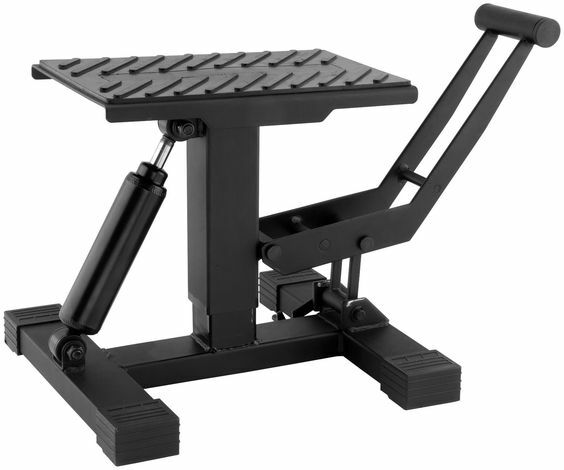 The load capacity is 300 pounds (136kg) and the stand itself weighs 63.8 pounds (29kg). It comes with 2-year Manufacturer Warranty, very important when buying a Lift Stand of this type. The Trackside Steel MX Box Stand would have to be the best value for money fixed MX stand available. Priced at around $40, it’s bang for your buck. Being constructed of steel it’s not as light as the Black Widow MX Stand at number 5 in this review, but still very suitable to be taken to the track or trail, and used in the home workshop as well. 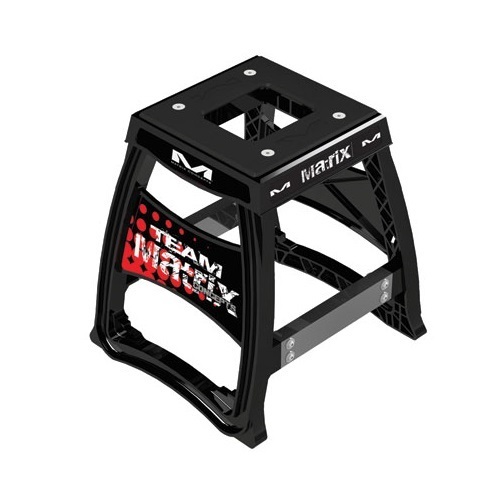 While the manufacturer doesn’t give a load capacity, given that the design is almost identical to the aluminum Black Widow MX stand which has a huge 1,500 pound capacity, you would assume that this stand must be more than capable of supporting any dirt bike you can lift onto it. The powder-coated finish is a bonus to help resistance to corrosion and ensure it stays looking good for a long time. 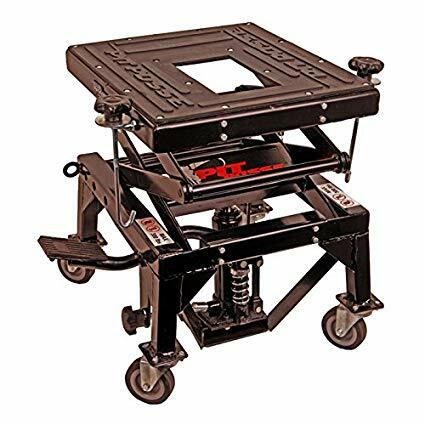 The large drain hole in the top platform makes doing oil changes easy, the only thing missing is a removable tray for tools or an oil pan, but for the price, you can slide any tray you want under it. 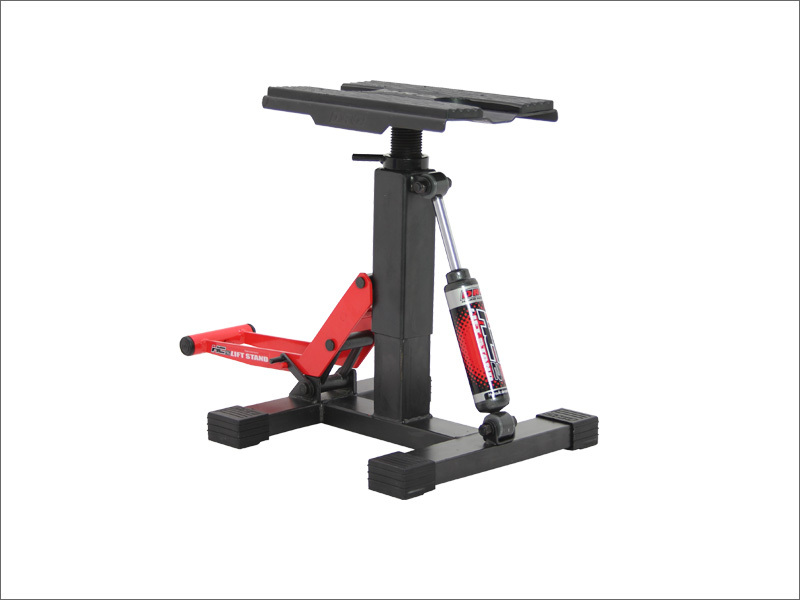 The Motorsport Products P12 Adjustable Lift Stand is made from high-quality aircraft aluminum. 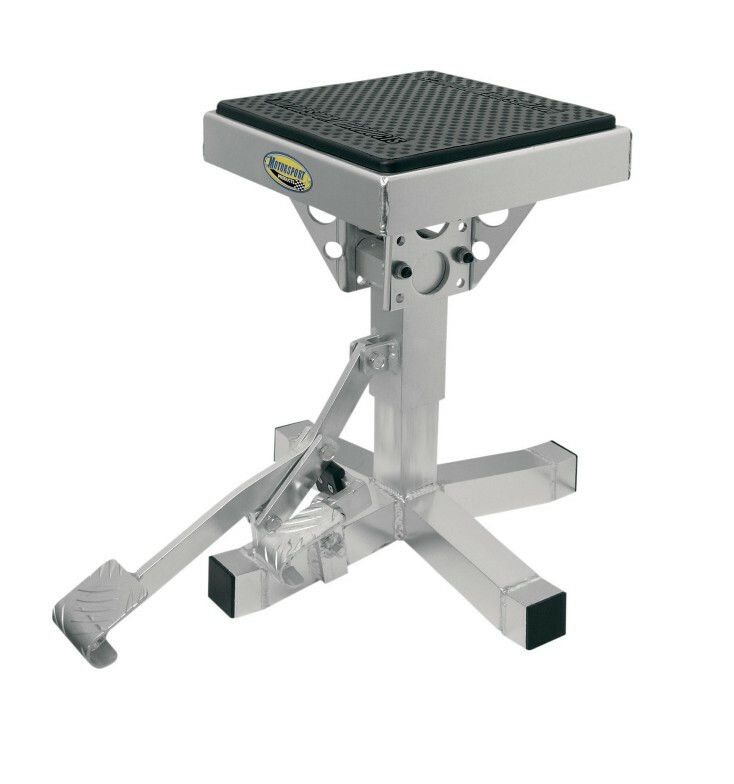 It is one of the most adjustable lift stands on the market today with 11 height positions from 9 1/2″ to 14 1/2″ max. The large heavy duty top plate easily supports the bike with both wheels off the ground. Youth riders can put their own bike on the stand with the easy to operate foot lever. A foot-activated release trigger with a nylon slider block lowers the bike. An extra thick rubber pad is riveted into place and is resistant to oil and gas spills. The lower legs are constructed from box aluminum tubing and are arched with flat ends to provide a wide stable stance to keep your bike stable even on uneven ground. 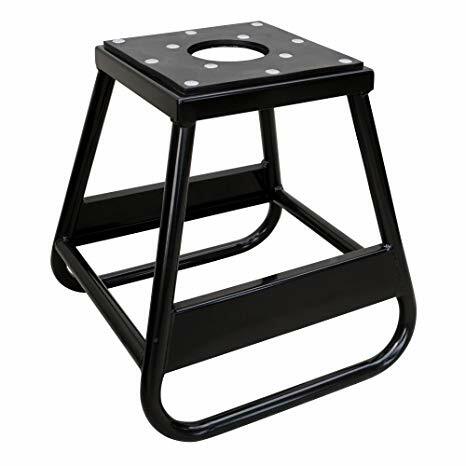 The Black Widow MX stand is a fixed stand which means you have to lift the back of your bike up and slide in on. This is a very popular MX stand. At just over 6 pounds it is extremely light as the name suggests, but is able to support a staggering 1,500 pounds, which is way more than you’ll ever need, but good for peace of mind. It’s ideal for both taking to the track or trail, and for home workshop use. It is manufactured from 1″ tube frame which is reinforced at the top and sides. It has a wide floor stance of 16 1/2″ x 16 5/8″ (420mm x 422mm) which helps its stability. The top platform is 10″ square with a riveted rubber pad to prevent the bike slipping which is resistant to gas and oil spills. A great feature is the removable tray which can be used for tools, spare parts or to catch oil when doing oil changes. 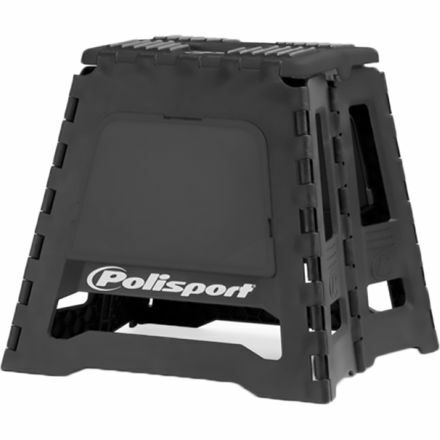 The Polisport Black Folding stand makes transporting your bike stand easy. The days of having a big cumbersome box stand taking up space in the back of your ute or truck are gone. This space-saving motorcycle stand is made from tough polypropylene plastic with injection molded rubber inserts. There is no assembly required – you just pull the legs apart and push the top ribbed section to lock it into place and you’re ready to go. The rubber ribs molded into the top means your bike won’t slip on it, and the huge 772-pound load capacity means it will support any dirt bike. Because of its clever design, it cannot collapse while there is a load on it. It will not corrode and is resistant to oil, chain lube, gas, and most chemicals. 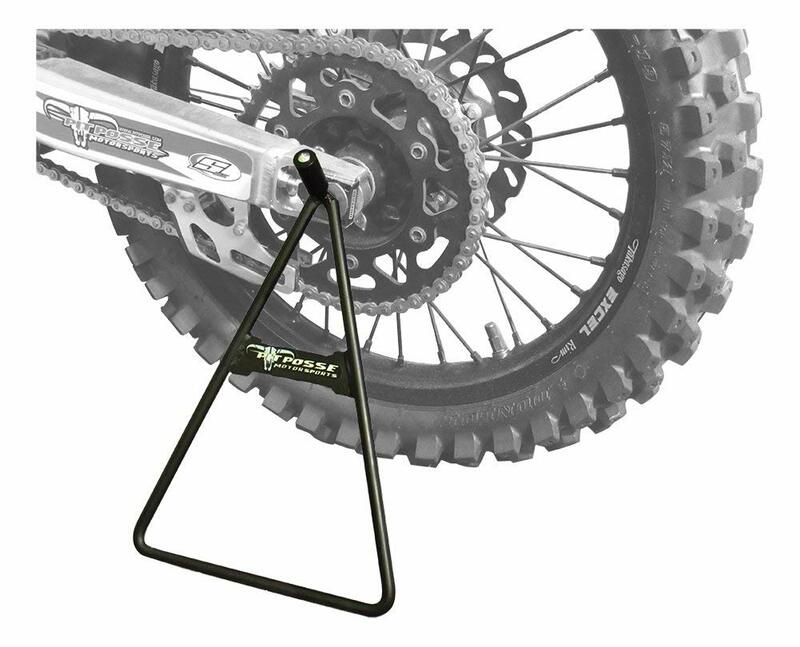 The Pit Posse PP2849 Universal Triangle side stand is perfect for when you just need to park your MX bike quickly and easily. 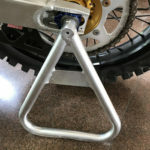 As motocross bikes don’t come with a fixed side stand for obvious safety reasons, the triangle stand is the simple solution, just slide it into the axle hole and you’re done. The great thing about the Pit Posse is that it fits three different axle hole sizes, 18mm, 14.5mm, and 11mm, so you’re covered for almost any dirt bike. The lifetime warranty is a huge bonus, as these stands get a pretty hard life. You know with Pit Posse your getting a top quality product. The DRC HC2 lift stand is one of the most versatile dirt bike lift stands on the market today. 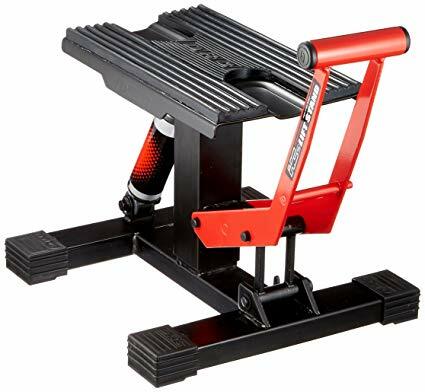 The top plate height can be adjusted to suit your bike by spinning it up or down on the threaded bar so that it can just be slid under your bike, then locked with the locking ring. 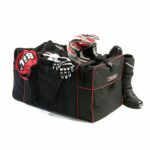 It can be adjusted to suit smaller youth dirt bikes, right up to full-size 500cc dirt bikes. The top plate has an anti-slip rubber pad which is essential to stop your bike slipping off the stand. The dual plates on the lifting arm give it extra stability when lifting. There is a safety hook which locks the arm in the down position to prevent accidental disengagement when the bike is on the stand. When lowering the bike, the damper shock slows the descent so that it doesn’t freefall. 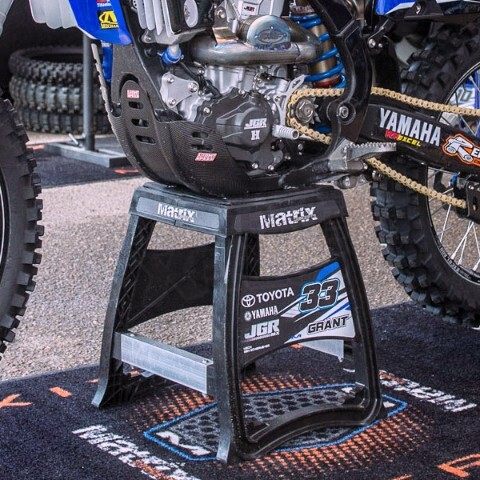 The Matrix Concepts M64 Elite Stand is what they call the ‘Next Generation of Lightweight Composite Off-Road Stands’. The plastic stand is made of a new composite blend of high-strength polycarbonate plastic that is exclusive to Matrix Concepts. It weighs only 10 pounds and is one of the most durable and lightweight motorcycle stands on the market today. The M64 is the stand that is used, tested and endorsed by some of the top teams in off-road racing, motocross, and Supercross. That says a lot about the quality, these guys wouldn’t use anything that doesn’t stand up to the pressures of racing. There is an optional M21 Stacking Tray (sold separately) with a magnetic strip that can be positioned on the top rail or snapped into the bottom, which can be used for tools or spare parts. The Motorsport Products 92-5012 MX Hydraulic Scissor Lift is the ultimate in motorcycle lift stands when only the best will do. 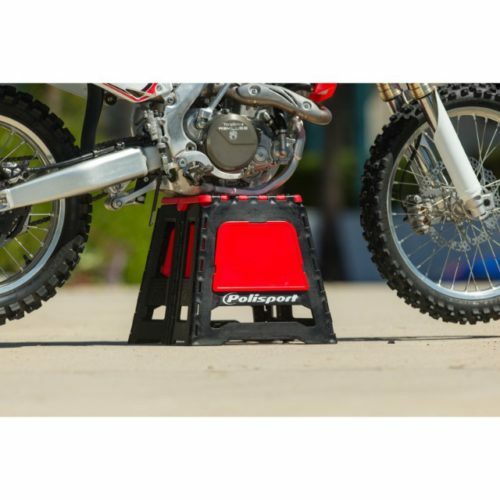 With a 300-pound weight capacity, it will safely lift any dirt bike to a comfortable standing work height. The range of 14″ at its lowest, to 33″ at its maximum is controlled by foot pedals to lift and lower your bike. Safety securing springs hook onto the footpegs and tension as the bike is raised, stabilizing the bike on the stand. A safety pin can be inserted into one of 4 positions across the lower frame which prevents the stand lowering in the event of a hydraulic ram failure. The top platform has a heavy duty rubber mat to prevent the bike slipping, which is oil and gas resistant, and there is a large hole for draining the oil during oil changes. This stand is definitely a workshop only lift due to the working height stability requiring a smooth even surface. Choosing a suitable dirt bike stand for your bike is really a matter of deciding where and how you intend to use it. The Fixed Stands are popular with motocrossers because they are light, stable and allow you to quickly lift the bike up and slide the stand under to work on between races. 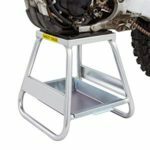 They are generally more stable than the Lift Stands, especially on the uneven ground at a motocross track. 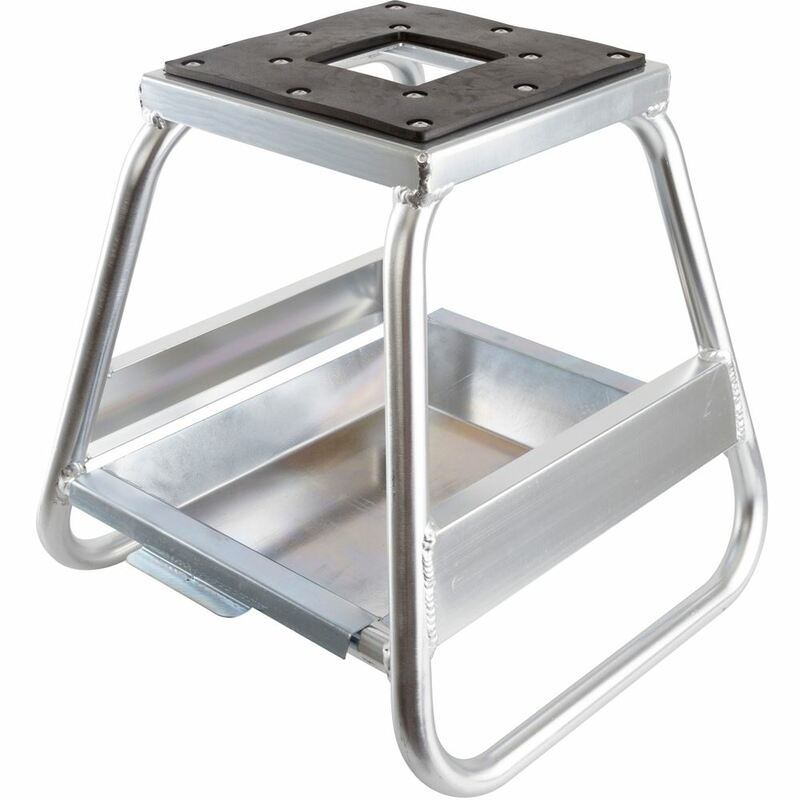 The Trackside Steel MX Box Stand is the most cost-effective fixed stand with ‘Bang for your Buck’. The adjustable lift stands are more suited to the workshop, although the more compact types are light enough to take with you to where you ride, which means you can get away with one stand. The BikeMaster Easy Lift & Lower Stand is my top pick for the Lift Stands. It has all the things you are looking for in a lift stand: Fully adjustable, safety features, damper shock – all for the best possible price. I have covered a broad range of all types of Dirt Bike Stands in this review from $39 right up to $261. All the stands in this review have overwhelmingly positive reviews from users. Just click the links to read what people are saying about them. Is there a dirt bike stand that you have been using that has served you well and would highly recommend? Please feel free to leave your thoughts below. Thanks for your review on dirt bike stands. I have recently gotten into dirt biking and now with your review I’m one more step in the right direction. There is tons of stuff that I still don’t know, but looking around your site, I don’t think I’ll have trouble finding them out. Thanks again. Hi David. Great that you’re getting into dirt biking. Yes, there’s lots to know about. You’ll find an answer to anything you need somewhere on my site. Hi Maria. Yes, the BikeMaster is my top pick for features and price. Most have a capacity way more than you need. There’s so many good stands available today. Hi Paul. There’s a stand to suit every bike and every use here. There are so many to choose from it’s hard to know. Glad I could be of some help. This was a very good and thorough review of the 10 best dirt bike stands. I have to say that the price points on these stands are great, with the most expensive being less than $300. I would have guessed just by looking at some of the lift stands that they would cost more. I have to say that my favourite would be the BikeMaster Easy Lift and Lower Stand, the ease of just pushing a lever is a big plus, as well as the sturdy steel construction. 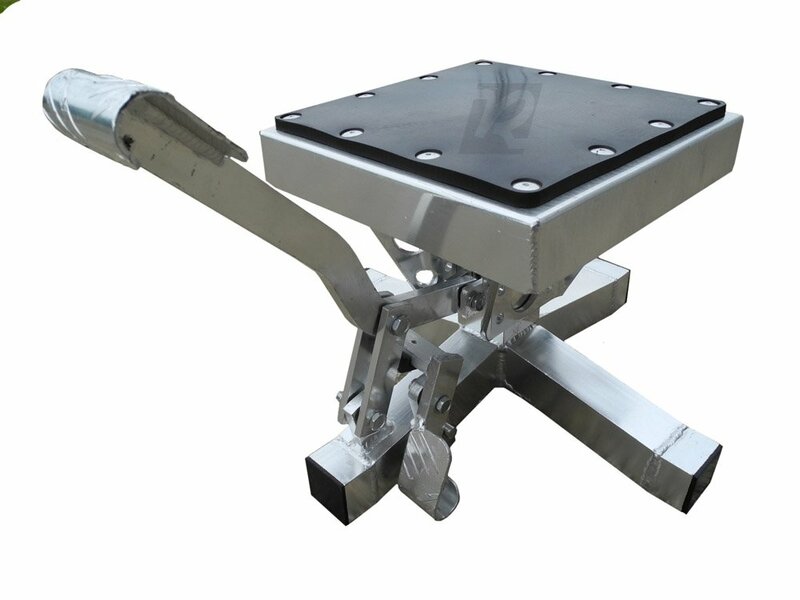 The safety features like the anti slip pad, and lever lock are very important. I like that this stand is portable too, eliminating the need for 2 stands. Hi Jenny, yes the BikeMaster is an excellent stand for a great price. There are lots similar, but not at the same price. If you can use one stand for at home and one away, that saves you some money.